How do I stitch applique embroidery designs? Basically applique embroidery designs consist of putting one piece over the other, hence the process consists of three main steps. a)	Designing the actual applique. b)	Locating the right place on the master cloth/ dress in which it has to put on. Often since you would be putting many appliqués, designing all of them in the right manner can determine the final success of the applique. c)	Actually stitching the appliqué on the master cloth. This has been discussed in depth below. Is applique an attractive way of embroidering? Applique is an attraction in itself. A beautifully done appliqué will stand out in a piece of dress or cloth. Two examples of simple but attractive applique embroidery designs could be this butterfly and giraffe below. Can I have some instructions for stitching beautiful applique embroidery designs? Definitely. Depending on whether hand/machine, a lot of instructions or tutorials are available. The basic art of creativity and able to visualise designs is necessary for stitching beautiful appliques. There are also Tutorials available on the net for you….. you would have to link to embroidery basic tutorials from the home page. These are for basic embroidery skills which will help you make designs at home both on your machine OR by hand. I found a good book on applique embroidery designs, Applique Basics: Flower Wreaths by an award winning master quilter, Karen Kay Buckley. Section 2 of this book gives details on various methods of applique. I also found this tutorial by Heather Snow on Amazing Applique ) – (kindly click on embroidery and go to programs and tutorials), which introduces several different applique concepts like 3 dimensional applique with fringe, traditional applique and reverse applique. How is appliqué different from cross stitch and other forms? Cross stitch involves designing on the master cloth itself. Applique is putting one cloth over the other. This is the major difference. Of course, cross stitch is an art of its own and has a lot of permutations and combinations. Below is a direct comparison of Santa Claus done in cross stitch vis a vis applique. If you notice in the cross stitch design, the threads are actually woven through the master cloth in a X format, but in the applique embroidery design, the design is on a separate fabric which would finally be put onto the master cloth. What cloth do I have to use for appliqué? You may use any kind of fabric or freeze paper. Since it is an add on that it one piece over the other, the only precaution to be taken is in the maintenance of the cloth namely water/sun resistant. This is to ensure long life of the appliqué. There are also many varieties than can be put on any light colour master cloth. Is there the need to have the right colour combinations during applique embroidery designs? Very necessary. The right colour match between the applique and the master cloth can make or break the beauty of the embroidery design. I found that by simply varying the color of the applique fabric, one can achieve completely different results with the same design, without changing the underlying fabric. Just take a look at the design below. See how the atmosphere of the whole design changes as you use different color of the applique fabric. Are there any creatures/animals that can be drawn using appliqué? Yes a lot of creature and animals can be easily drawn using appliqué. Attractive and colourful looking creatures can be done on cloth or paper and then put onto the required destination (dress/cloth) using applique methods. Do I have to be an artist to do applique. In a way, yes. Not an artist in the sense of painting but an artist in the art of being able to visualize and then turn the dream into reality. There are those who do appliqués by merely copying designs, but the true appliqués are done with a personal touch of the person making the design. Please remember that no two appliqués can be the same, ever. A lot of imagination comes in handy while designing an appliqué. The same design can look completely different using different threads and different fabric. Also the art of correct placement of the appliqués on the desired master cloth has to be learnt by training and practice. What do I need to know for doing applique? On the technical front, you should be having a knowhow of stitching. You should be adept at needling your way around the designs. In case you want to use machines, then knowhow of the machine is necessary. The more important knowledge, however is knowing which design would suit which environment or cloth. Taking it a step further, knowing even the right locations of placing the design for maximum visual impact. In a nutshell, putting the right thing in the right place. A lot of stress is laid on knowing the art of designs since if you have mastered this, the actual stitching can always be outsourced. . You can also go through this tutorial I found on the net -- Amazing Applique Tutorial – (kindly click on embroidery and go to programs and tutorials). What are the various categories in which that I can do applique? Although there would be many categories that appliqué could be grouped into, there are four main methods or categories. They are the baste method, freezer paper method, needle turn method and finally the reverse applique. The above categories are neatly explained Here. The common and popular types of applique to name a few are animals, baby, face applique. These days, font applique is catching in quickly. Apart from this, a category of applique coming into the limelight is the appliscape variety. The Oriental landscape, the Victorian garden and the Mexican garden all fall under this category. Does machine applique come as beautiful as hand? This all depends on the ability of the person who does it. Ideally traditional appliqué is best done by hand, since this gives a personal touch to it. But considering standardization and speed, machines have come into the limelight. Machine finish is excellent, hence when it comes to making mass appliques of the same design to be sold in market, machine is preferred. Also when it comes to making large size appliques collating many smaller appliques together, machine comes in handy. 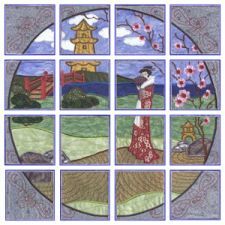 This works well for portrayal of garden landscapes and is referred to as appliscape, more of applique plus landscape. Just check this one out from a picture of the original artwork by Lourdes S McClure. Example of a machine applique made of 16 small appliques, all put together to make a superb machine applique embroidery design of an oriental landscaped garden. And an example of hand applique can be seen in this bedsheet with hand embroidered applique with the applique designs strewn all over. How many appliqué per hour can I do using embroidery machines? There is no predetermined time that can be allotted per appliqué. Where appliqué differs from other types of embroidery is that there is a lot of creativity involved. Hence depending on the appliqué designs and patterns, time may vary. Having a machine need not necessarily predict the number of appliqués that can be done in a specific period of time. A Design or pattern made specially for baby dresses or items used by babies like nappies, bedsheets is termed as baby appliqué. There is a general tendency to get the babies dressed up in a cute fashion and appliqué comes as a correct handshake. Hence the fame of baby applique. What are the various baby designs that can be made using applique? There are countless baby appliqué desings to date. All that is suited to making a baby look cute and attractive, both in dresses and items of use like hankies, bedsheets, nappies form the master cloth over which cute designs suited to babies can be put on using any of the above mentioned techniques, generally best done by hand. Not at all. The same ease with which all other appliqués are done. Here the focus is on making the dress as pretty as possible. Only in the sense that the kind of designs are cute, could be cartoon characters or other designs. Is the material used good for baby skin? It depends on the actual material used for the master cloth. Since the appliqué is put on the master cloth and does not touch the skin of the baby, it may not matter which material is actually used but it should be preferred that it be of a soft material, since there is a chance that the baby would keep caressing it . Where can I find some good applique embroidery designs? e)	 Embroidery DesignsOur own digitized designs. $12.95per set or $45.00 for everything. : Designs By Sick : This is a small site but contains some good unique designs on applique.